Senator Joni Ernst in Sioux City. A caravan of around 7,000 Central America refugees continues through southern Mexico on its way to the United States to seek asylum. Some U.S. Officials say they aren’t convinced everyone in the group is seeking asylum and President Donald Trump may send our military to the border to deal with the large number of migrants. 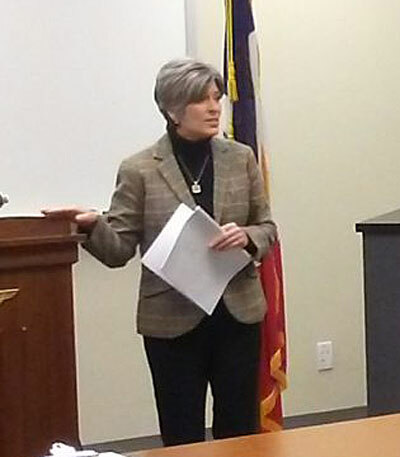 Iowa Senator Joni Ernst says there is the set process to be admitted to the United States. “We have proper procedures for immigrating into the United States. For those that wish to seek asylum — they need to declare that and they need to go through their proper hearings,” Ernst says. Senators Chuck Grassley of Iowa and Mike Lee of Utah called on the Trump Administration to seek an agreement with Mexico to assist in accommodating the stream of migrants traveling through Mexico seeking asylum. The senators noted acknowledgments by former Obama administration officials that potential security threats are exploiting immigration vulnerabilities to enter the United States. Grassley also said recently the president is justified in his threat to send troops to defend our nation’s southern border and to stop what Grassley describes as the “attack on national sovereignty” from the caravan.